1. Mogami tears or CV tears? Playing with a focus on getting to higher tiers. No. 1 self-created issue of most players in f2p titles. Patronising these players for doing something the game encourages them to do. Classy. You call it patronising, I call it giving a hint. Let me ask you, what will you get on high tiers outside of battles with mostly unbalanced/unfinished/missing content? Oh yeah... Uchuu Senkan Yamato, greatest pile of scrap metal battleship in human history. Gotta rush that grind and get that Maus/Me-262/Yamato, gogogo. (Note (because this is the internet): These are stereotypes of typical "I NEED THIS VEHICLE NOW!" examples and in no way related directly to you. I find people amusing that feel forced to get up to "the top" in f2p games like WoT, WT or AW. Because... hey... that's exactly the kind of feeling f2p developers hope to incite inside their playerbase. Mush mush mush, gotta grind faster! Grind too slow? Buy premium, grab a premium vehicle and complain about not enough x2/x3 events. In mmorpgs that rush is kind of justifyable. They usually keep raids and more difficult (read: enjoyable) content to the top levels. in CW is still a fairly wonky strategy for various reasons. There's no difference between a Yamato fighting a Des Moines or a Myogi fighting a Kuma. It's two ships duking it out. No mate what you're doing is dictionary definition patronisation. Technically old games like BF2 which included progression and unlock systems are "f2p" if you get past the whole money-up-front bit. You take exponentially longer and longer to unlock new weapons (that aren't even strictly better than the base weapons). 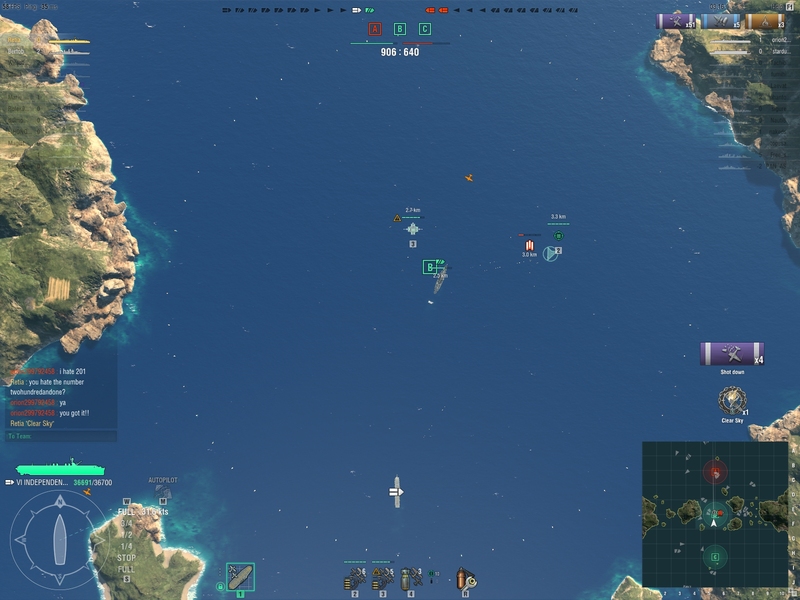 What separates this game from WOWS? I guess it's a more honest business model - you pay up front, the game is balanced around having a fun experience rather than cynical business decisions designed for fleecing you with microtransactions (which is a misnomer, WOWS is one of the most expensive F2P games I've ever seen). Assuming you looked at my warshipstats profile? Good for you. I just looked at yours too. Looks like you earn around double the xp I do, I guess that your 8% total games played in CV was enough for you? USN CV aren't babies first warship, they're an agonizing grind that you rush to get through to the good stuff because they're awful and there is light at the end of the tunnel in the essex and midway. I should note they also just nerfed ranger xp generation by 3% again (without any justification as I've proven through the metrics) which means that it takes even longer to get through this awful, awful ship. And they just nerfed the lexington base kit because they're incapable of properly balancing the other 2 loadouts. Maybe if the CV lines were balanced better at tiers 4-8 this wouldn't be such a big issue but they're not and the statistical evidence over 100's of thousands of games is there to prove it. Technically old games like BF2 which included progression and unlock systems are "f2p" if you get past the whole money-up-front bit. You take exponentially longer and longer to unlock new weapons (that aren't even strictly better than the base weapons). I don't even know what to reply to this. Mhmm... "We all live in our own worlds"... I guess. (which is a misnomer, WOWS is one of the most expensive F2P games I've ever seen). What? Have you played two f2p games so far and the other one was Team Fortress? I guess that your 8% total games played in CV was enough for you? So you chose not to have a look at my CBT profile or stop for a moment and wonder if perhaps I've also been an alpha tester? USN CV aren't babies first warship, they're an agonizing grind that you rush to get through to the good stuff because they're awful and there is light at the end of the tunnel in the essex and midway. Yeah, quite agonizing, isn't it? I don't even know what to reply to this. I'm not surprised you don't have a response to a progression model not based around throwing $ at the designers. Literally P2W with premium ships/consumables. What? Have you played two f2p games so far and the other one was Team Fortress? Technically EVEO is f2p if you're good enough, DNDO, TF2, Runescape, I legit don't even know how many f2p games I've played because I've been doing pc gaming for over 20 years. But this was just your troll bait wasn't it? You can't create a real discussion. You don't think $180/yr for a game with an extremely limited amount of content is expensive? I'm at a loss here, wasn't CBT months and months ago? How is that even relevant to the modern game? Also p.s. buddy you're what's known as UAT. I dunno man I find being pidgeonholed in to one role with one competitive fit to be pretty agonising. Yes you can play strike but then you're gambling on not having a competent AS cv on the other team wrecking your day. Especially as USN vs IJN where they can cover more ground and do more damage (statistically proven). Let's pretend for second here I go with airsup configuration for USN, aren't I just contributing to the tunnel-vision gameplay that leads IJN cv captains to cry about being UP when in fact they're already OP and being made more so patch after patch? hey @Seabad use can't use red word here.it is reserve for the admin. tears of players complaining "CV nerf" "OP this, OP that" "xxxx is under powered"
I'm not surprised you don't have a response to a progression model not based around throwing $ at the designers. Literally P2W with premium ships/consumables. a different outcome is madness. You don't think $180/yr for a game with an extremely limited amount of content is expensive? Or you could make more exp per battle by performing better. I'm at a loss here, wasn't CBT months and months ago? How is that even relevant to the modern game? be an important piece to this discussion. So basically, you want to be a sniper with dual shotguns and full body armor. Because why have different pros and cons for certain classes/nations when you can be Call of Duty? Retia you don't have an argument. A meme video isn't an argument. Platitudes aren't an argument. I could make more xp running AS but I don't want to run AS because that's pidgeon holing. Being facetious isn't an argument. 8% CV fights in the live game is all you have to your name. Thx. Your call of duty response is out of place also, are you 17? Oh p.s. IJN hold all the cards. With 50%-100% more planes in the air I can't see how you have an argument anywhere. Is the balance between the ships real? No. The metrics show they're unbalanced. Is the playstyle balanced? No. Because fighters lock down squads and there's no way to buff HP for bombers but you can buff HP for fighters lending to fighters being OP in any configuration and then you get more fighters per loadout as IJN. Does having only 1 fighter in strike make them UP against USN? No, because that's still one more fighter than a strike USN, and its still a fighter than can tie up a AS fighter while the other squads moon walk through. Loadouts don't change fighter stats, they're the same animal the whole way through from start to finish. But you knew all of this because you're a special snowflake User Acceptance Tester and you've seen (and recommended) this garbage to pass through QA and go live. And the 30% difference in expressed power between most IJN>USN cv is partly your fault. The sometimes 500% KDR difference, the 20% higher damage, the prevalence of IJN hulls in the modern game especially on SEA. Is your fault. But hey go throw your memes at me more I like the comedy of watching someone punch the keyboard with their forehead. How on earth are people even being forced to pay anything to play World of Warships? Last I checked, the game didn't lock you out from anything for missed payments. Imagine if it did lol WG wouldn't dare. They wouldn't have a playerbase if they did. Why bother dealing with improbable hypotheticals? They never made WoT subscription-based nor anything you really needed to shell out for ('cept maybe premium shells, but making them available for credits kind of changed that), nor have they showed intention to. I'd wish it was my fault, but Darwin was faster. I think what Seabad is trying to convey is that both the Ranger and Hiryuu should be balanced in the way that, if a person of equal skill played both, they should reach T8 in the same amount of games. Right now, Ranger requires 131.5k exp to get to T8 and Hiryuu requires 136k. Adding a -3% effectively puts it to 135k. However I do not know the current base rates. Anyways, the go to mods for Hiryuu are 2-2-2 and for ranger, 1-1-1. A 2-0-2 ranger is useless as all he will be doing is air denial, which rewards no exp and bombers do too little alpha damage and rely heavily on RNG. A 0-1-3 ranger will be shut down by a Hiryuu as a Hiryuu will always have a fighter squad. Thus a equally skilled 2-2-2 Hiryuu will always do more damage compared to a 1-1-1 Ranger. Not one this, a Hiryuu can kill the ranger with their first salvo, but a Ranger cannot with a 1-1-1 configuration. I've only played Hiryuu and even I agree that a ranger is underpowered. Forgot to add - with strafe costing 3 bars of ammo instead of 2 and the damage decrease from 6x > 3x, a 1 fighter Ranger can barely keep up with the two Hiryuu fighters. I'm not saying Ranger needs to or should play 2-0-2 or be buffed to 2-1-1 but the Ranger does need a buff. Also, a Mogami definitely needs a buff to her range as if you have ever played Mogami with 155mms, her turret blows up immediately. But the main focus of the post is about CVs. A 2-0-2 ranger is useless as all he will be doing is air denial, which rewards no exp and bombers do too little alpha damage and rely heavily on RNG. (Not including fire damage) per squadron&attack run sounds good to me. Do you actually have a point? How are you meant to attack a CV with strike against fighters? Fire isn't an instant death-note for a CV you know?? And if the Hiryuu on the other side were to run 3-1-2, they could easily stop both your fighters and neutralize your DBs while doing at least alpha damage with their TBs. The 4 - 10 k damage also assumes you actually hit your bombs which rely on RNG instead of the skill which TBs use. it also assumes your bombs actually do damage in it's alpha strike. Yeah no, he could either intercept the DBs or the fighters, or enjoy losing his fighters in an uneven fight, which will result in losing aerial superiority mid game. It's possible to miss BBs or CVs with DBs? I've never done that unless there were other factors included. I'd love to see that, any replays provided would be appreciated. It can be truly frightening to see the full extend of darwinism on display. What was the phrase again? 3x4 IJN fighters statistically do not win over 2x6 USN fighters. Sure this may be cherry picking but you will rarely hit 4, most of the time 3 and this is with the tight area of IJN and a stationary target. Say you were running 3-1-2 against the enemy 2-0-2. You can engage both their fighters leaving one free to attack their DBs. Or you could engage both their fighters while you are about to attack your target. Sure they may be able to destroy both your squads but you will still accomplish your main objective - destroying their DBs or attacking your target. Also ideally if you're IJN, given your maths, you would never engage a USN's fighter squad unless it's over friendly AA or if you're going to attack their carrier. A Hiryu player attempting to use 1 squad to try to bring down 2 Ranger DBs never really works (I play a Hiryu [with air supremacy so 3x5] and Indy) Even Indy DBs takes some time. Whereas if you try to use 2 fighter squads to engage 2 USN squads, the time taken for 2 USN Squads to vaporize your 2 IJN squads are fast. When I 3-1-2 Hiryu, I notice I run out of TBs VERY quickly. Sure I have lots of fighters and a healthy amount of DBs, but losing a TB squad really hurts your strike capabilities. 312 Hiryus have 36 fighters, 24 DBs but only 12 TBs. Lose a squad of TBs and thats 1/3 of your torpedo capabilities. 202 Rangers have 37 fighters and DBs. You can lose a couple of them and youll be fine. You can easily take both DBs down with a good alt-attack. Otherwise, you can engage them while they are dropping to make them completely miss (engaging one and then the other). The point is tho, both ranger and hiryuu should have the same grind to their T8 counterparts and right now that isn't happening with at least what the statistics on warships today is saying. I know you think you're being clever but you're not. You again ignore the evidence presented plain and clear on the metrics. You have no case. Be quiet kiddie. Then its a matter of skill over statistical controlled analysis. I decide to leave skill out of the case altogether, one could easily say a USN squad could wipe out nearly all your 3 IJN squads with a good Alt Attack.